Amid President Donald Trump’s unsubstantiated claims of massive voter fraud in the 2016 election, bills have been introduced in at least 20 states that would make it more difficult for many people to vote. In some states, such as Texas and Arkansas, lawmakers are responding to court rulings that struck down or scaled back earlier attempts to restrict voting. Bills in other states would make changes to early voting and registration deadlines. Related: Why Are Republicans Making It Harder to Fight Voter Fraud? Proponents of the legislation say the proposed limitations, such as requiring a photo ID and eliminating Election Day registration, are necessary to restore public confidence in the electoral system. They say the measures protect the integrity of the ballot box by confirming voters’ identities and whether they are qualified to vote. In state legislatures the measures are backed mainly by Republicans, though polls show that most Democrats also support a photo ID requirement. But critics point to a lack of evidence of voter fraud, and say the restrictions are unnecessary and unfairly discriminate against minorities and poor people, who may not have a birth certificate, passport or driver’s license. 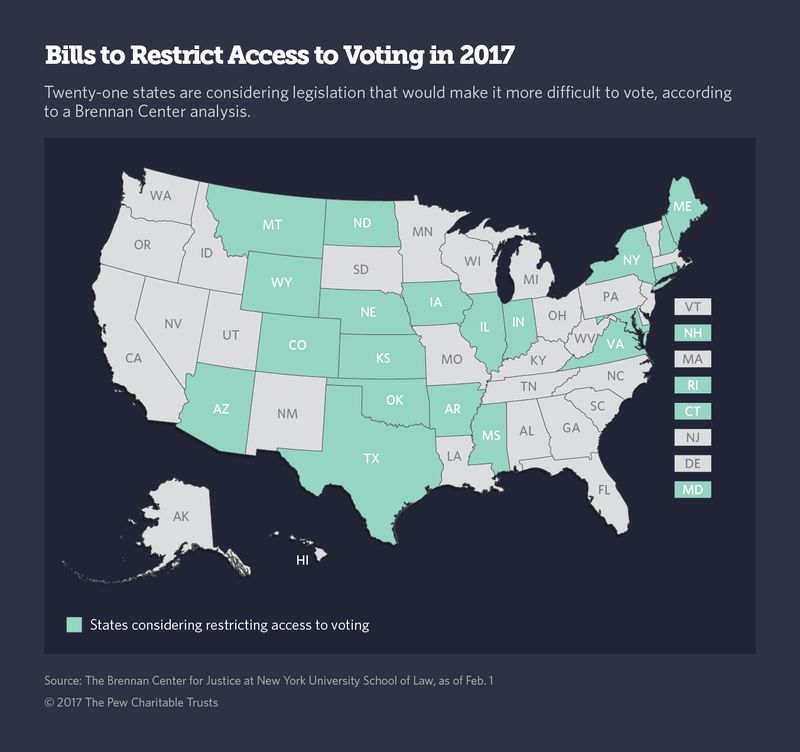 According to an analysis this month from the Brennan Center for Justice at the New York University School of Law, bills in 21 states would impose new restrictions on voting. At least twelve states are considering bills that would require a photo ID to vote, or expand existing ID requirements. Legislators in Texas and Virginia want to require proof of citizenship to register to vote, which would prevent unauthorized immigrants from casting ballots. Bills in Connecticut and Iowa, among others, would eliminate Election Day registration. Some states such as Colorado, Iowa and Texas are considering bills that would shorten the early voting period. Still others would limit who can collect and turn in ballots for other people. With some of the proposals, lawmakers are attempting to modify laws that have been struck down or blunted in court, in hopes that they will be able to withstand judicial review. In Arkansas, for example, where a 2013 photo ID law was struck down by the courts, Lowery and other Republicans have introduced a bill that would expand the accepted forms of identification, such as a driver’s license, to include student IDs and public assistance cards that have a photo. “I don’t buy the argument that there would be a lot of people who don’t have a photo ID,” Lowery said, but broadening the accepted forms of ID will make it easier for people who do have trouble getting some types of ID. Critics who have challenged the laws before say the new attempts may not take care of the legal problems with the restrictions. Since Election Day, Trump has repeatedly called the election “rigged” and claimed, without evidence, that between 3 million and 5 million undocumented immigrants voted illegally. But research has found in-person voter fraud to be extremely rare, as are cases of voting by people who aren’t U.S. citizens. News reports following the 2016 election found nearly no cases of fraud. One recent study found that Hispanics are the most affected by voter ID laws, with turnout 7 percent lower for Hispanic voters in states with strict voter ID laws. In Texas, a 2011 law allowed people to vote only if they had one of seven approved forms of ID, including a driver’s license, military ID or passport. But a ruling by the 5th U.S. Circuit Court of Appeals blunted the law by allowing people who did not have one of the accepted IDs to vote as long as they filled out an affidavit first. A legal battle over whether the law was intended to discriminate against minorities is ongoing. A federal court in Texas is scheduled to hear arguments in the case this week. Meanwhile, the state is considering a number of bills that would restrict access to voting. In addition to bills requiring proof of citizenship to vote, the state is considering shortening its early voting period, limiting absentee voting, and changing its photo ID law. A bill introduced last week would allow those without a photo ID to present a utility bill or paycheck along with an affidavit. But it would impose harsh penalties — up to 10 years in prison — for people who use the alternatives when they do possess an ID. The bill is designed to comply with the earlier U.S. Circuit Court ruling that said the state should offer free birth certificates and give people without IDs a way to cast a ballot. Ezra Rosenberg with the Lawyers’ Committee for Civil Rights Under Law, which has brought one of the cases against the law, said the bill addresses some of the court’s concerns. But he said the harsh penalties for people who have an ID but instead use one of the alternatives could intimidate voters. In Kansas, officials tried to require voters to prove their citizenship before their votes could be counted in state elections, something that wasn’t required of people who registered to vote using the federal form or at a Department of Motor Vehicles office. A state court judge said Secretary of State Kris Kobach, a Republican, lacked the authority to require those voters to cast provisional ballots in state elections, and a federal court judge issued an injunction requiring Kansas to count the votes of all registered voters for the 2016 election. Kobach’s office has now asked for legislation to expand the power of the office, allowing them to set aside ballots cast in state and local elections until a voter can show proof of citizenship. “This bill does exactly that — what the state court judge says we did not have the authority to do,” said Bryan Caskey, the deputy assistant secretary of state for elections. Micah Kubic, executive director of the American Civil Liberties Union of Kansas, which has previously challenged Kobach’s proof of citizenship requirement, said passing the legislation won’t help the state withstand future court battles. “State courts have ruled he does not have the authority under statute to do this, but if the Legislature gives him the authority under statute to do it, it doesn’t mean constitutional issues get waived away,” he said. In Arkansas, legislators are considering a constitutional amendment that would require photo ID to vote after a similar 2013 law was struck down. The Arkansas Supreme Court said the law contradicted the state constitution by adding an additional requirement to vote without the necessary two-thirds vote of the Legislature. Arkansas lawmakers have the power to amend the voting rights and procedures section of their constitution without referring the changes to voters if approved by a two-thirds majority of each house. Lowery said his proposal would avoid problems by requiring an ID to verify someone’s voter registration rather than making it a prerequisite to vote. Lang said tailoring a law to deal with registration rather than voting is a “distinction without a difference” because the law could still stop people from voting. Legislators are also still weighing a separate constitutional amendment requiring photo ID to vote. If approved, voters would settle the matter in the 2018 election. The number of states with photo ID laws and other restrictive voting laws has expanded considerably since a 2013 U.S. Supreme Court decision struck down a provision of the federal Voting Rights Act that required some states and counties, mainly in the South, to get the U.S. Department of Justice’s approval before changing election laws. Voters in 14 states faced new restrictions on voting in the 2016 election. The photo ID bills proposed this year in a dozen states vary widely. In North Dakota, only a driver’s license, a non-driver ID or a tribal ID would be acceptable. In other states, student IDs, concealed carry permits and military IDs could also be used. In Iowa, Republican Secretary of State Paul Pate defended the state’s elections as “clean and fair” after Trump claimed the system was rigged. He is now pushing a bill that would require ID to vote and would make voter ID cards without photos available to people who don’t have photo ID. The bar codes on the IDs would allow the state to ensure that ballots are not cast in two places. Many of the other bills include strict photo ID requirements, which can be tough for people who lack the underlying documentation, such as a birth certificate, needed to get an ID. Some can’t afford the costs of getting an official birth certificate or were born under circumstances in which they never had one. Such is the case for many Native Americans living in North Dakota. Like Texas, North Dakota is considering tweaks to its photo ID laws while they are still being challenged in court. A bill there would allow people to use a utility bill or government check to supplement IDs without addresses, something common among tribal IDs. But Williams said the changes likely wouldn’t help Native Americans because many get mail at a P.O. box instead of their physical address. In some states, such as Texas, lawmakers want to require proof of citizenship to vote. “The honor system is nice. It’s quaint,” but it doesn’t do enough, said Texas state Sen. Van Taylor, a Republican whose bill would require linking the state’s voter registration database with a Department of Public Safety database that has citizenship information for people with state IDs. He points to the story of a Mexican woman brought to the U.S. as a child who was sentenced to eight years in prison after she registered to vote and later cast ballots in 2012 and 2014 as proof that noncitizens do vote in elections. The woman, who has previously voted Republican, said she was unaware she was not allowed to vote. Taylor’s proposal would likely affect many of the same people affected by the state’s photo ID law. And having a state-issued ID doesn’t necessarily prove that someone is a citizen: there are more than 139,000 people with Texas IDs whose citizenship status is unknown to the state, according to the Texas Department of Public Safety.